Oracle Records is proud to present Belgium Hardrock legend Irish Coffee live on stage. At July 14, 2018 original singer William Souffreau and his pals are gonna play the Kulturbahnhof (KuBa) Kempen (west from Krefeld). It’s gonna be their only concert in Germany and their second ever this side of the border! Hardrock-connoisseurs rate Irish Coffee not only one of the best of their country but their first and long time only album from 1971 is regarded in the same reference-class as classic LPs by Led Zeppelin, Black Sabbath, Deep Purple or Uriah Heep. Originals of this album easily fetch 4-digits price-tags nowadays if one is offered at all! 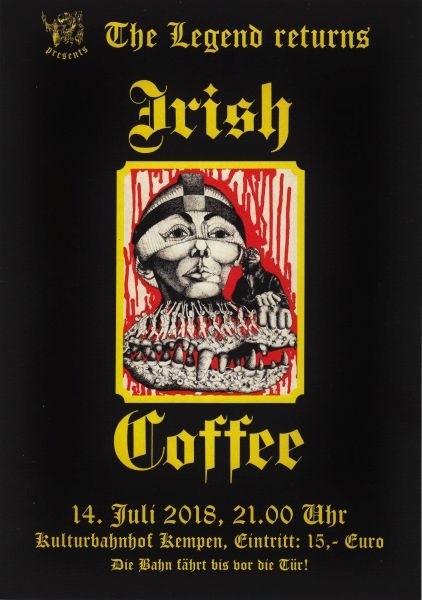 Irish Coffee originally played the classic line-up of 2 guitars, keyboards, bass and drums, although they sounded less than their British counterparts but more with a certain Krautrock-charm (despite their origin) like a mixture of Birth Control and early Scorpions. Their main trademarks are the voice of William Souffreau, who’s also responsible for most of their material. He can still claim to be one of the best Hardrock-singers in the world. Plus there’s guitarist Jean van der Schueren who didn’t play the usual Hardrock-riffs but fantastic fluid licks that perfectly fit the melodies. The original band split in 1974 after keyboarder Paul Lambert was killed in a tragic car-crash.. It took them ‘til 2002 to reunite Irish Coffee. Unfortunately without Jean van der Schueren, who’s now a music teacher at a Belgian university. Meanwhile also the keyboards have been replaced by a third guitar but Irish Coffee still retain their distinctive sound due to the trademark-voice of William Souffreau. If you don’t want to drive yourself or have a few drinks I’d recommend the good old railway even though this means of transport usually ain’t first choice in Germany. But the train runs right up to the club’s door and you have to walk only 10 steps to be there. Plus you could get home as late as 2 a.m. from Kempen via Krefeld to the Ruhrgebiet-area or Cologne or north to Nijmegen/NL. The entrance-fee is 15.- Euro but there’s a maximum capacity of 200 visitors. You simply can’t squeeze any more into the location! So be there in time, I’d be happy to welcome you to this event!